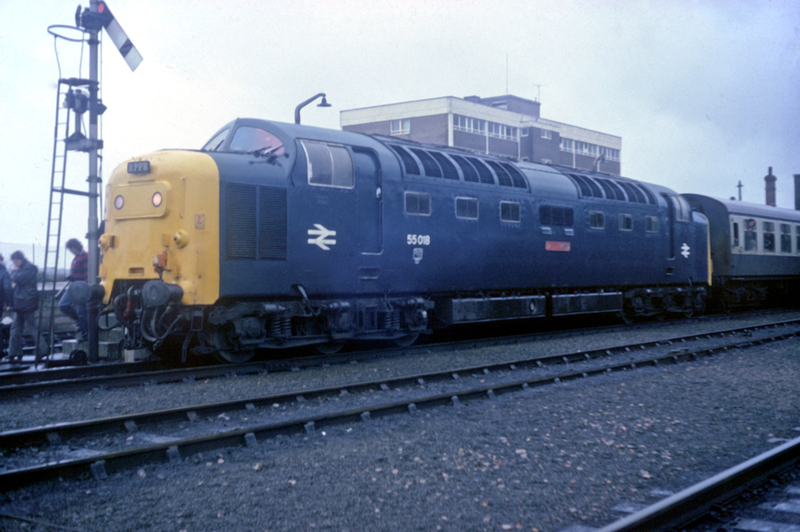 Following successful trials with a prototype locomotive British Railways ordered twenty-two (22) 3,300hp diesel electric locomotives for high-speed running on the East Coast main line between London Kings Cross, Newcastle and Edinburgh. Delivery of the locomotives, which had been ordered from the English Electric Co Ltd, commenced in 1961. 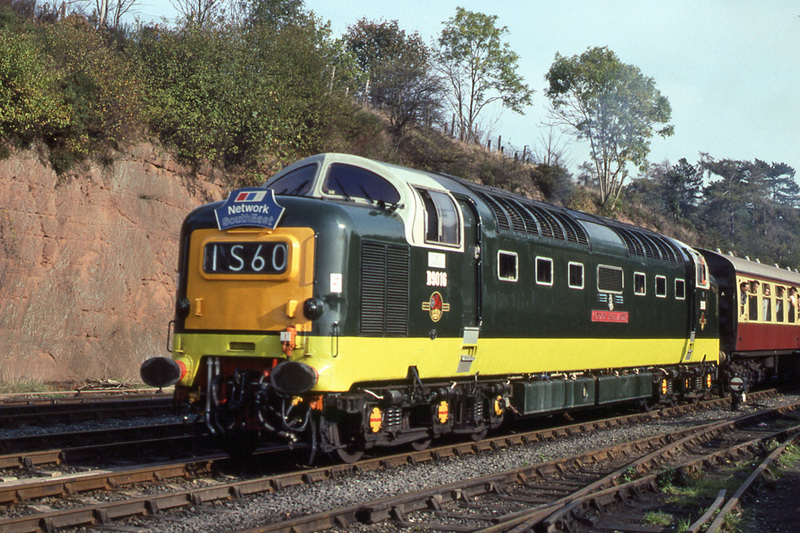 They gained the title 'Deltics' as this name was painted on the prototype locomotive, which in turn was named for its Napier Deltic power units. They remained in service until replaced by Inter City 125 'High Speed Trains'. The whole class had been withdrawn by the end of 1981 although six were sold into preservation. This was a rare appearance in Worcestershire by one of these East Coast race horses whilst in B.R. service - there was at least one other. This is No.55018 'Ballymoss' on the occasion of the Welsh Dragon railtour on 29th January 1978 - further details of this train can be found at http://www.sixbellsjunction.co.uk/70s/780129rp.htmll. As a three-year old stallion the other Ballymoss finished second to Crepello (BR No.D9012/55012) in the Derby and won the St Leger at Doncaster. Photograph taken by Phil Bullock. Class 55 diesel locomotive No.D9016 'Gordon Highlander' complete with Network South East headboard approaching Bewdley Station with a Severn Valley Railway service from Kidderminster to Bridgnorth on 13th October 1990. Photograph taken by Andrew Smith. 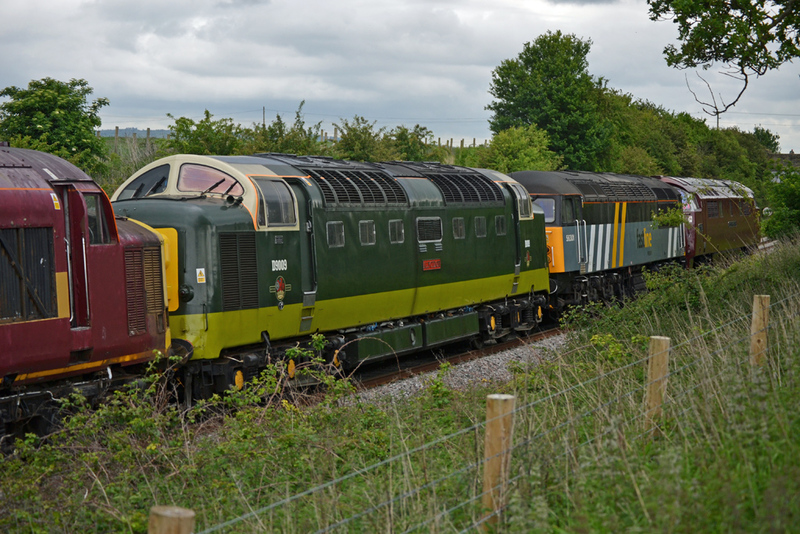 Third in a cavalcade of locomotives being returned from Swanage to Barrow Hill via the Severn Valley Railway was 'Deltic' class 55 diesel locomotive No.D9009 'Alycidon' with class 56 diesel locomotive No.56301 and 'Western' class 52 No.D1062 'Western Courier'. 'Alycidon' was a racing stallion who finished second in the Derby in 1948 and won the Ascot Gold Cup in 1949. Photograph taken by Andrew Smith at Abbotswood on 17th May 2011. 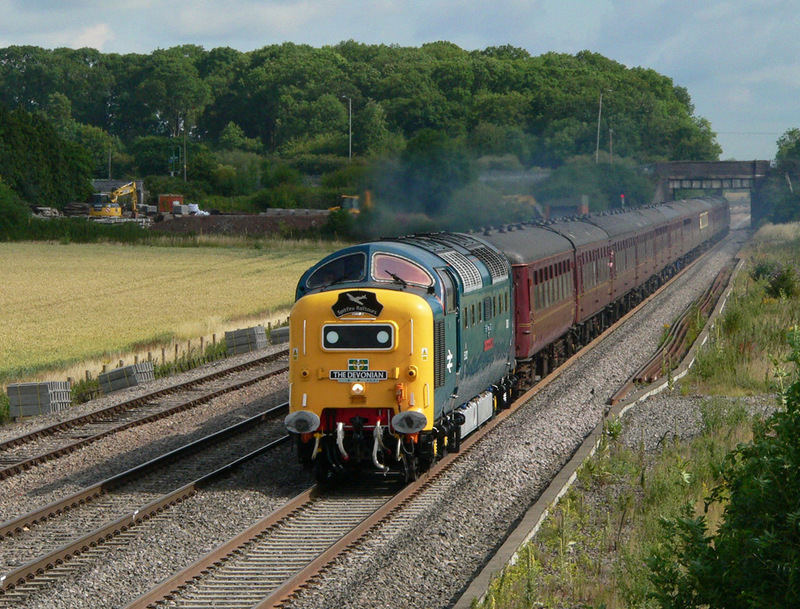 In perfect early morning lighting, class 55 'Deltic' locomotive No.55022 'Royal Scots Grey' runs south through Spetchley with train code No.1Z32 'The Devonian' which departed from Doncaster at 05.15 bound for Paignton. Photograph taken by Robert Cooke on 9th July 2011.